2018 has seen some major developments when it comes to nuclear weapons. It's time to say 'never again', Natalie Bennett writes. 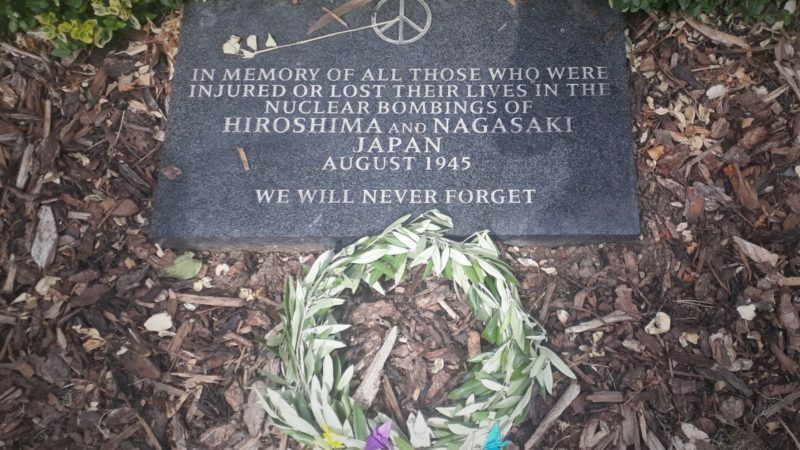 Today is Nagasaki Day – the second chance in the year to remember the estimated 129,000 people who died when the US dropped two nuclear bombs on Japan in 1944. Many people will be out commemorating, remembering the dead, as they were on Monday for Hiroshima Day. But they will also be saying ‘Never Again’. I was at the Bradford ceremony on Monday, organised by Yorkshire CND. A poignant moment there came when a local campaigner lit a peace candle, one that’s been used for many years at the same ceremony – more years, she said, than she could remember. Like many of the participants, she’s been signed up and working for decades to create a nuclear-free world. Over the last year, there have been times when that hope – that we can avoid annihilation of the world as we know it — seemed further away than ever. There’s understandable fear and concern, among campaigners and the general public, about the increasing risk of the deliberate or accidental use of nuclear weapons, in the age of Donald Trump and otherwise rising global instability. This year the Doomsday Clock was moved to just two minutes to midnight, in part because of those fear. The people of Hawaii suffered 38 minutes of panic when a warning that a nuclear missile was targeted on them was accidentally sent. And there are some suggesting that we should again start training people to prepare for a nuclear attack, as though as we were once taught, “ducking under your desk”, would be any sort of preparation at all. But this year there is also fresh hope. Fourteen countries have now ratified the treaty for a global ban on nuclear weapons, Mexico and New Zealand among the most recent of them. It is a treaty backed by the majority of the world’s countries, who are going through their own procedures to bring it into formal force (which will happen when 50 states have ratified or acceded to it). This is a crucial period. Collectively, the world’s nuclear states are looking over the next decade to spend $1 trillion in updating their weapons, something that only adds to the dangers of conflict in a time when the US is frighteningly increasingly talking about “low yield” weapons – “only” as big as the Hiroshima and Nagasaki bombs. But that also offers a possibility. No country can afford that expenditure, in an age of poverty, inequality, and the threats of climate change and environmental collapse. And every country in the world has to be worried about President Trump’s control of nuclear weapons. That presents an opportunity to take the ban not just into force, but into effect, ridding the world of nuclear weapons. Britain has a huge opportunity here – a chance to make a massive positive global impact, after we’ve done so much damage with military adverturism in Afghanistan and Iraq and arms exports to rights abusers. As one of the world’s nuclear powers, albeit holding only 1% of the world’s nuclear weapons, if we were to decide not to replace Trident nuclear weapons, but instead to sign and ratify the global treaty, we could create huge impetus to bring others along. We’d save ourselves at least £205 billion – money for which we would have no problem finding far better uses. But more than that, we’d be make a big contribution to a more secure, stable world for ourselves, and for every other human being on this planet. The Bradford candle campaigner has decided it is time to donate the candle to the UK Peace Museum in Bradford, marking an end of an era for her. It is time that we also end the global era of fear and insecurity that has been the Nuclear Age. The Post-Nuclear Age will be one in which we face many challenges, but ending the danger of nuclear destruction will equip us far better for those. Natalie Bennett is the former leader of the Green Party, and writes regularly for Left Foot Forward.